There are several ways for using joystick on VB.NET: APIs and DirectX. 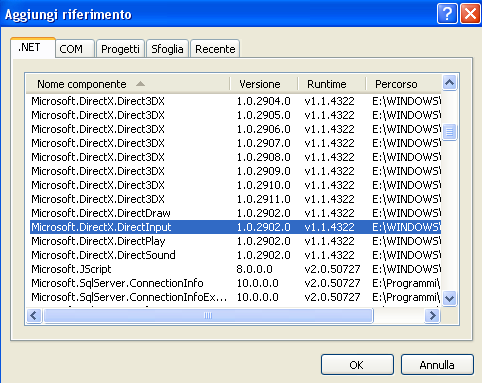 Here I'll show you the DirectX Method. Add a timer (timer1) on your form and set "Enabled" property on true (we'll use it for joystick polling).
' There is one controller at least? state object will contain all informations you need. State.X is the X position of joystick (type state followed by dot and see the entire list of controls). 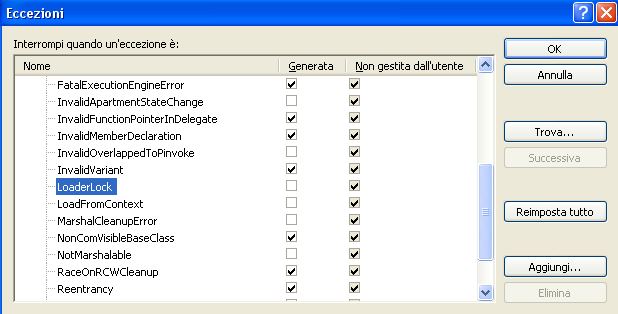 the GetButtons property of state object will give you the state of buttons. GetButtons give an array. VBatt+ is the main voltage on TC35 (on TC35i this is called only Batt+), located on pins 1-5 of the module. VDDLP is a secondary power source used for RTCC backup, located on pin 30. IGT is the ignition line, used to turn on the module, pin 15. 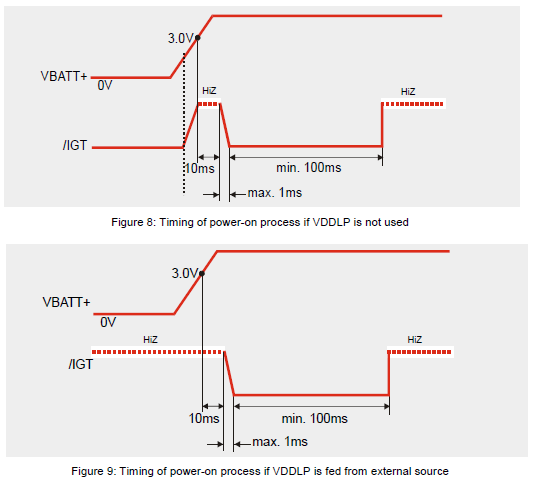 As you see from the diagrams, the module will no power up with only with VBatt+, but it needs a signal on IGT pin for at least 100mS at low level when you power up the main line. 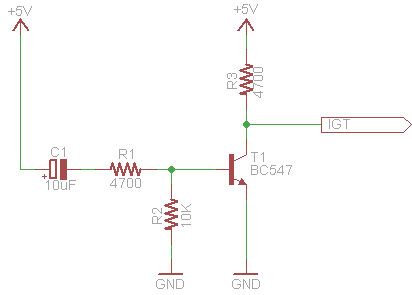 After the 100mS at low level, IGT line must go to High Impedance, but I've tried with a circuit that goes to high level instead High impedance without any damage (please try it at your own risk!). 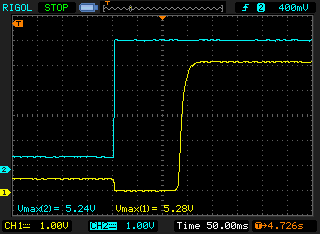 When you power up the circuit (+5V), C1 will let pass some current (until it's fully charged). This current, through R1 will take T1 to saturation, closing collector with emitter and then on IGT line there is 0V. When C1 is fully charged (after about 150mS, RC constant of this circuit is of 147mS), T1 will be interdicted because C1 will stop the current flow and then the base of T1 will tied down by R2. In this condition the circuit betwewn collector and emitter will open and the IGT goes to high level thanks R3 (pullup resistor). The Cyan line is the main power, yellow is the IGniTion line. After power-up, the IGT line goes to low level for about 130mS (time for C1 charging) and then goes to high level. The microcotroller is connected to this circuit using the lines I've named as CLOCK, DATA and LATCH. The 74HC595 has a shift register and a latch. Incoming data are sent into shift register using pin 14 (DS, serial data in) and pin 11 (SH_CP, Shift register clock). When we've finished to sent serial data, we must transfer data from shift register to the latch pulling high the pin 12 (ST_CP, Storage clock). If pin 13 (OE, output enable) is pulled down, the output pins (Q0-Q7) will reflect the latch status. Pin 10 is the Master Reset, pulling it down will cause the reset of the shift register. Pin 9 is serial data out and is used to drive more 74HC595. We must feed data on DATA line using CLOCK and keeping LATCH down. When we have finished to send data, LATCH line must be pulled high and data are transferred from shift register to latch and value is displayed on leds. We must pull LATCH down before start a new transfer but leds will remain in actual state. This is possible because pin 13 (OE = output enabled) is always low and then outputs are always enabled. 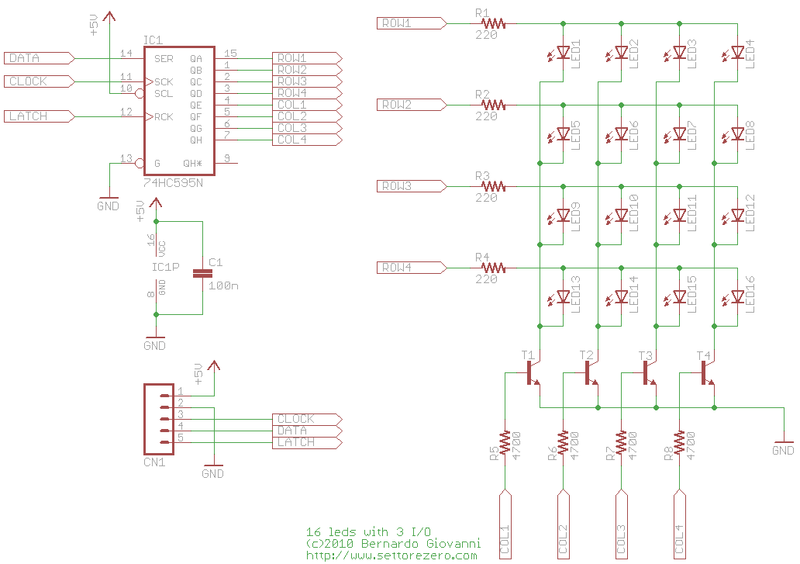 In order to display a value on 16 leds, data must be multiplexed. Entire first row will be lighted from serial value 0001 1111 : remember that high nibble drives the columns, low nibble drives the rowss. Entire second row will be lighted sending value 0010 1111 . Second led of third row (row=3 column=2) will be lighted sending value 0010 0010 and so on. 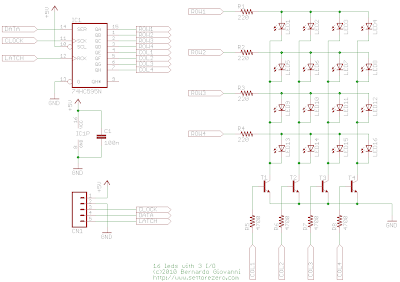 Using a latched shift register will prevent the ghosting effect on leds. - after you've send data, you must enable and then disable latch. There are some examples here on how to use one or more 74HC595 with Arduino.